The teaching staff at Wee Wisdom Preschool attended The Oregon Association for the Education of Young Children's Fall Conference. Schedule included attending keynote speaker, Janet Gonzales-Mena, M.A. "Better Together Build Bridges, Behavioral Parent Training for Aggressive and Defiant Disorders, The Importance of Outdoor Play for Young Children by Amanda Armitage, the FABULOUS: Children Out of Sync by Diedra Pine (sensory issues) and Imagination Yoga..Inspiring Young Children to Move by Jamie Hopkins & Jessica McClintic..
were able to take these classes. These are paid for by fundraiser funds. 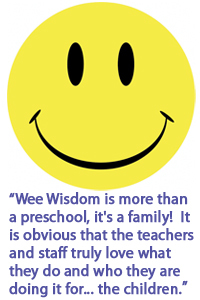 Wee Wisdom Preschool Teachers are committed to creating a nurturing environment where a child's imagination, sense of wonder and love of learning become part of the life skills that will serve them well when they leave us for kindergarten. We never stop learning about what is appropriate developmental learning for the young child at Wee Wisdom Preschool. Those happy faces are not just "cute"..they are for real!